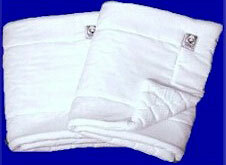 Wilkers top of the line combo quilted leg wraps have been a favorite for years with the horse crowd. Proudly made in the USA, this 50/50 broadcloth top repels shavings and dirt on the exterior with a super soft 100% cotton flannel underside, quilted over 1/2" foam. Available in pairs. These are great Wilker's shipping quilts. Most horses will wear a shorter size on the front legs vs. the back legs. Size: 12", 14", 16" and 18"